France: The first event for the Good Food March took place in France at the beginning of August at the Jazz and Folk Festival in Tardeau. 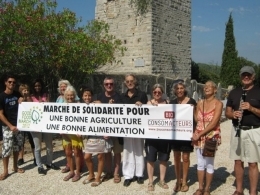 Since then Good Food March partners Bio Consom’acteurs Provence have decided to organise at least one Good Food March action per week until 19th September. Last week saw a ‘Good Food March and Blues’ event with a jazz trio that is into Food Sovereignty. Romania: On 07.08.2012 an evening of local food tasting and photo taking was held in a new and popular venue in Bucharest. 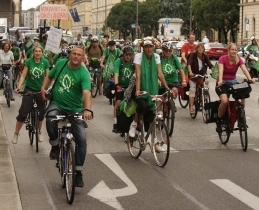 Germany: On 25th August 1,500 gathered in Odensplatz in Munich for the launch event of the German bike tour to Brussels. 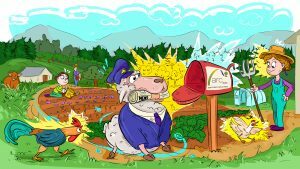 The Teller statt Tonne event saw vegetables that normally get thrown out, be cooked publically before being served to participants sitting at tables alongside key representatives working on food and farming issues. Poland: On August 15th, an event in Poznan saw the world’s biggest drum make some noise for good food! Bulgaria: In the Earth Market of Cherni Vit, Sofia on 25.08 visitors found artisan food and handicrafts, followed by a round table with Dr. Dessislava Dimitrova and Tzvetan Dimitrov with the topic “The cultural identity of Bulgarians and preservation of disappearing folklore and food”. Bike tours from France, Belgium, The Netherlands, Germany and Austria will arrive in Brussels in a few weeks. Wearing Good Food March T-shirts, bikes accessorised with stickers and flags, the participants will be passing through towns and villages across Europe on the way. The Austrian and Dutch routes were the first to get underway, both starting on 17 August. The Austrian route met the German route in Munich on August 25, and they are now all travelling together – travelling chef in tow! The route in the Netherlands is taking part in stages, with farm visits taking place over the weekends leading up to the final day of the march. Each week they are moving closer to Brussels. A French route from Calais is due to start on September 13. An additional route from the south of France is also taking place from September 1st, but will only see two people travel the whole journey, as they attend a series of events taking place in 16 départements (from south to north). Learn more on the French page. All bike tours will arrive in Brussels on September 18 and stay over night in the Parc du Cinquantenaire (Jubel Park) for a night of story sharing, good food and preparation for the final day on the march – September 19 (more below). 10.30 Marchers depart Parc du Cinquantenaire (Jubel Park) and walk to the European Parliament stopping at various EU institutions to deliver the photo albums filled with the demands and testimonials of EU citizens on the future of the CAP. 12.30 Arrival in front of EU Parliament for the Good Food Brunch, workshops, music and much more. Marchers will be joined for by citizens, NGOs and MEPs. 15.00 ARC2020 and Slow Food Conference starts in the EU Parliament, under the patronage of Martin Schulz. Speakers will include marchers, farmers and citizens from across the EU, as well as Agriculture Commissioner Dacian Ciolos. 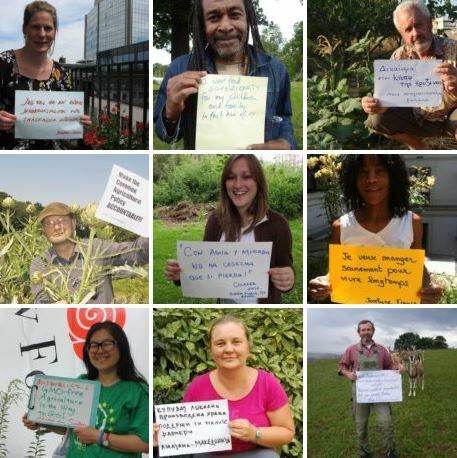 The CAP we want – photo campaignThere is still time to send your photo for the Good Food March photo campaign. 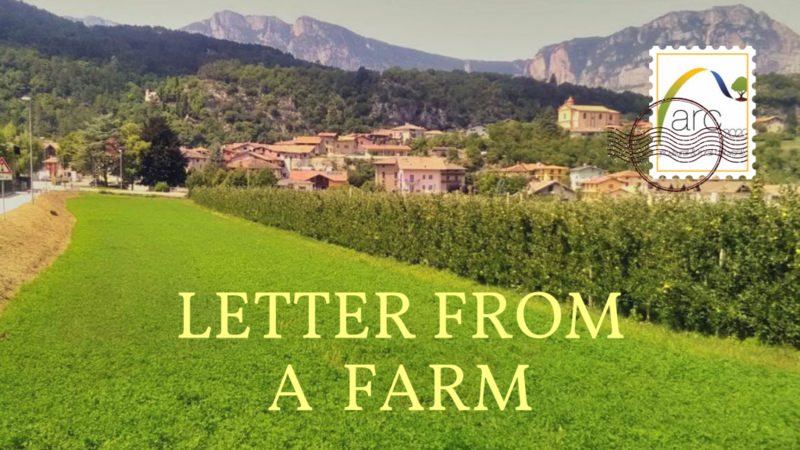 All photos we receive before 12th September will be put into a photo album and be presented to EU representatives in Brussels on the final day of the Good Food March. For inspiration, click here to see all the photos we have so far!